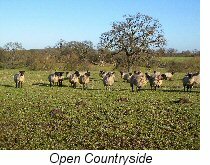 The walk is a little over 3 miles, mostly flat across open countryside, through farmland. It is an ideal gentle stroll for a sunny weekend, before taking refreshment at one of the two pubs mentioned. During the walk you will enjoy a delightful section of the Millennium Way, the route being clearly marked by the distinctive green waymarkers. 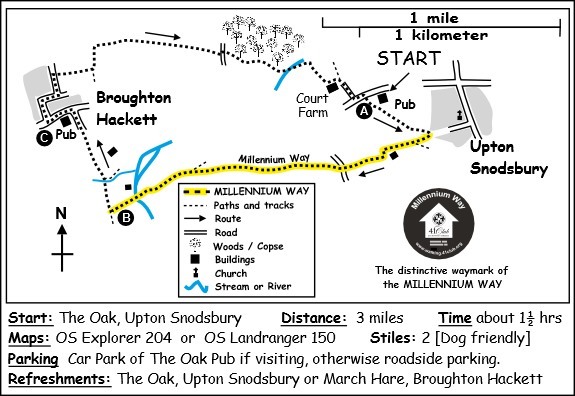 Our instructions start from The Oak pub, but if you prefer you can take the circular walk from The March Hare by following the route instructions from C. Find out more about the walk by clicking on the information icon. 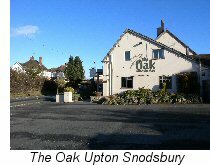 Our walk starts from the Car Park of The Oak, situated on the A422 just outside the village of Upton Snodsbury. Cross the stile at the bottom corner of the car park then go diagonally left up the field keeping Upton Snodsbury church on your left. Take the metal kissing gate at top of field then go half right towards corner of concrete wall to right of barn. Here you will find a wooden gate post, and see the first green Millennium Way Waymarker. Go 20 paces keeping barn left to pass through metal gate. Continue ahead through farm buildings to find driveway leading to road. Cross road and go ahead to end of farm track to find two large gates. Take the small gate adjacent to the right hand gate into field. Stay ahead across centre of field to take mid hedge gap by wooden waypost. Go directly ahead towards copse, then through copse and across next field to find metal footbridge over river. The footbridge is about 100m to the left of the farm buildings. Once across the footbridge follow Millennium Way way marker ¼ left up the field just to right of large lone oak tree towards a wire fence ahead of you where you will find a waymarker on the fence posts (Here you will leave the Millennium Way which goes left along the same fence). Turn right at this fence marker post, staying in the same field, and keeping wire fence left go to large metal gate in field corner. Go through gate and continue ahead under power lines towards track in dip ahead. Cross cattle grid and proceed up surfaced lane to main road turning left to reach The March Hare. Continue past The March Hare and take the first lane on the right. Ignore footpath left at top of lane and follow lane around right and then turn first left just after black and white cottage ( signposted Crowle.) Take marked footpath right through the churchyard of St. Leonard's Church and head for gap in top right hand corner to continue along narrow path between hedges. Go through kissing gate and continue ahead with hedge left, then take hedge gap ahead and follow path left along wide grassy area between low hedges. Take metal kissing gate ahead on right then go with hedge left down field. Here you will see Upton Snodsbury church ahead in the distance. When you reach the end of the hedge, continue directly ahead to pass under power lines to reach farm track. Go slightly left to cross track taking the waymarked path and go with hedge right. On reaching the corner take the stile then half left to take metal footbridge across river. Take metal gate into paddock ahead then just before green metal gate ahead go left in front of gate as waymarked to follow fence beside small lake. ( If the paddock has been divided up with electric fences you may have to negotiate a permissive route. )Take metal gate at end of paddock turning immediately right to follow fence up field to take stile then skirt left around farm buildings to reach farm track through small metal gate. Go right on track to reach the main road, turning left to arrive back at The Oak. 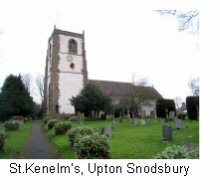 Upton Snodsbury Parish was once three villages – Upton, Snodsbury and Cowsden – and was recorded in the Domesday Book in 1086. Before the current settlement of Upton Snodsbury was formed there was an Iron Age Fort at Castle Hill, above Bow Wood. It remains an important archaeological site today. The church of St Kenelm’s has some fine stained glass windows, including several from the 1960s and 1970s by Francis Skeat, and it stands on the site of an older church dating back to Saxon times. In the grounds is the base of a preaching cross dating back to the 13th century, and the church registers go back to 1577. The parish was once surrounded by orchards containing plum, apple and other fruit trees. These provided cider and food for the farm labourers and their families as well as for market. A few orchards still remain and since 2006 an “Apple Day” has been held in the village in October. Several properties in the village are reputed to house ghosts. Most famously, Bull Cottages are said to be haunted following the brutal murder of the owner and her maid in 1707. The remains of the gibbet from which the perpetrator was hanged was found in the grounds of Bull Cottages. Upton Snodsbury C of E First School was founded in 1865. The then vicar’s mother, Mrs Alice Greene, wanted to improve the education of the parish children: the Sunday School was the only education provided and had 70 children attending regularly. She bequeathed the rents from three cottages to found the school and the same building is used today for teaching children aged 4 to 9 years old. Approaching the village from the south, an adventure activities centre is passed. 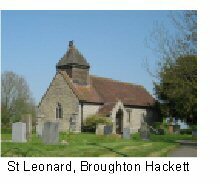 Broughton Hackett church is dedicated to St Leonard, the simple building dates from the 12th century. The village includes several timber-framed cottages, some black and white and others with brick filling. Attached to Manor House Farm is a square timber-framed pigeonhouse of the 17th century.